Politico reports that after quietly preparing for re-election during the last few months, President Barack Obama officially began his run for a second term on Saturday with a speech in Columbus, Ohio. Introduced by first lady Michelle Obama, who spoke about her husband's understanding of what it means to come from humble beginnings, Obama took sharp aim at Republican presidential hopeful Mitt Romney and his business experience. 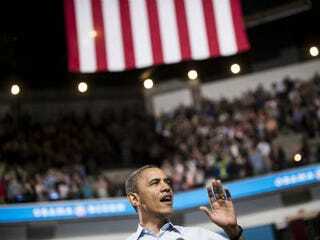 The campaign was only able to muster 14,000 supporters in an arena designed to hold more than 18,000. Several thousand empty seats ringed its upper deck, mostly out of view from the cameras. “We are going to win this thing the old fashioned way — door-to-door, block-by-block, neighborhood by neighborhood,” said Obama, ditching the suit and tie for his 2008 campaign uniform — shirtsleeves, carefully cuffed at the forearm, and tan chinos. Michelle Obama, introducing her husband, made a direct pitch to students and soon-to-be grads — going so far as to urge them to re-register at their new addresses after graduating in June so they will be eligible to vote.